On the first morning of the Road Trip I stopped by the Jackson County Republican Office in Medford, OR. 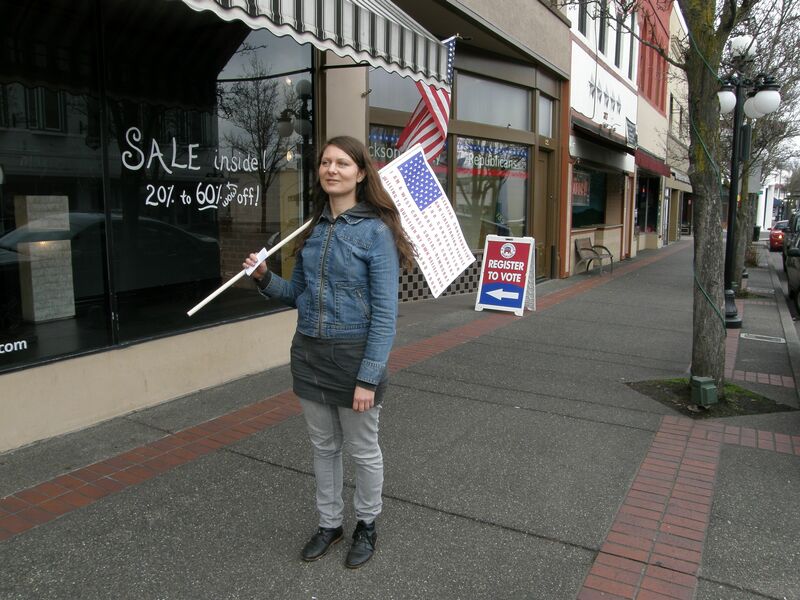 I brought my invitational flag and told the two men inside their Main St. storefront that I was a left-leaning person who for the most part lived around only people with similar political perspective, and was looking to talk with conservative people about their political perspective. They said hello with warm, calm expressions and one of the men, who was my parents’ age, invited me to sit down at a desk with him to talk. Humble but confident in his way of speaking, he looked right into my eyes when he spoke and had an exacting memory for dates and statistics. He worked with both the Republican Party and with Freedom Works Oregon, which is a Tea Party group, and said he didn’t really like any of the major candidates in the Republican primaries. He stated that “corporate cronyism” was one of the major problems in politics right now and he saw the common ground between that position and some of the motivation for the Occupy movement. He described a number of local political situations where local people tried to come up with their own economic innovations only to be stopped by a combination of government regulation and the big businesses who give major political contributions. He noted that people of my generation and his own children have a hardship that he didn’t have which is the scarcity of jobs. His opinion is that with less government regulation American businesses could produce products at more competitive prices so that we wouldn’t be buying so much from third world companies who pollute and mistreat workers in worse ways than Americans would allow. I didn’t really dig into this argument in the conversation, but it rings in my head afterwards. In my opinion, while it may be the higher level of worker and environmental regulation in the US that makes China’s products cheaper to import, it doesn’t seem that taking away our regulations and allowing for higher worker exploitation and lower pollution standards would be a solution Americans would really want to live with. Since many of his opinions were so close to opinions progressive people believe, I asked about why he chose to identify as conservative. In his opinion he wasn’t simply conservative or libertarian, he voted and acted according to whatever he thought would help small business people and individuals be able to take care of themselves as best as possible. For him the basic premise of that self-initiative is the rights of the individual over the rule of collective interests – because in his opinion whoever gets to decide what is in the best interests of us all becomes someone assuming they know better than he does about what is good for him.